I wish I had known about Scarguard last year! I had a minor surgery and had stitches to close up the wound. I took care of the wound as my doctor instructed. When the doctor removed the stitches, he said it was healing nicely. And it was. It looked like the scar would be barely noticeable. Then something happened. Over the next week the scar started getting itchy and had a pimple develop over top of it. It started changing. It grew into a thick, raised red scar and looked terrible. I saw my doctor about a month later and showed him the scar. He said that happens sometimes during the healing process. I found out that I had developed a hypertrophic scar. I figured I’d just have to live with it and hoped that it would shrink and get less red over time. 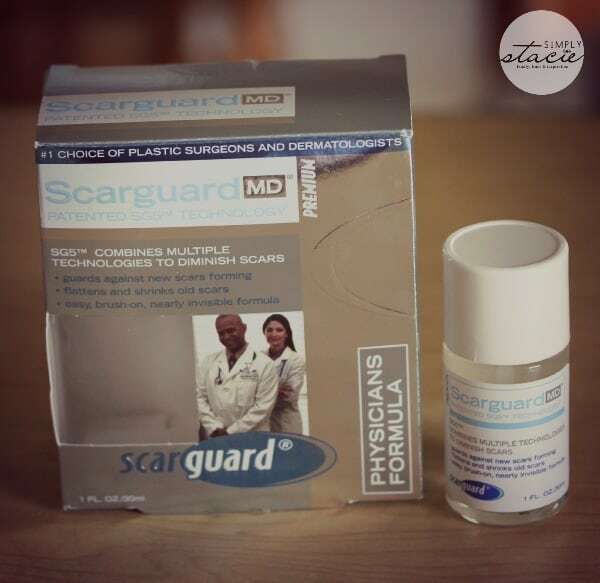 I only recently learned about Scarguard MD, a trusted scar treatment product that was developed by a plastic surgeon named Dr. Joel Studin. Scarguard is the #1 scar treatment recommended by plastic surgeons. It can be used on injury, facial, burn and surgical scars. It uses a proprietary Nanofilm technology so you don’t even need to put a bandage over the scar. When applied to the scar, the product forms a clear protective film over top the scar and keeps it protected from sweat, clothing, etc. Note that Scarguard should only be used on actual scars and not open wounds. I like that you can’t barely see the product after its applied. The film it forms over the scar is nearly invisible. If you have a scar on your face, you can use it under your makeup. It reminds me a little of second skin especially when you need to remove it. You simply just lift it away with a piece of Scotch tape. It has a slight medicinal smell for a few seconds when you are applying it, but after that I didn’t notice a smell at all. In fact, I forgot I even applied it. I’ve been applying Scarguard twice a day: once after my shower and once before bed. It seems to be helping. The scar looks a lot paler than before. Patients typically use it for 2 to 4 months on average so I’ll continue applying it. In addition to Scarguard MD, I had a chance to learn about more of the Scarguard product line up. 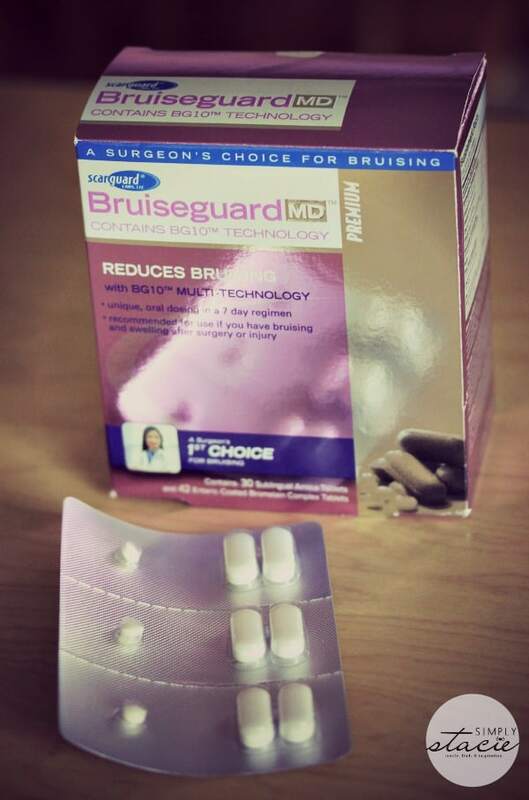 Bruiseguard MD is 7-day regimen that helps the body fade bruising after surgery or injury. It’s taken orally in pill form and contains arnica and bromelain. It’s meant to be used the day after an injury. This would have been helpful when I twisted my ankle a few years ago and had a nasty bruise! 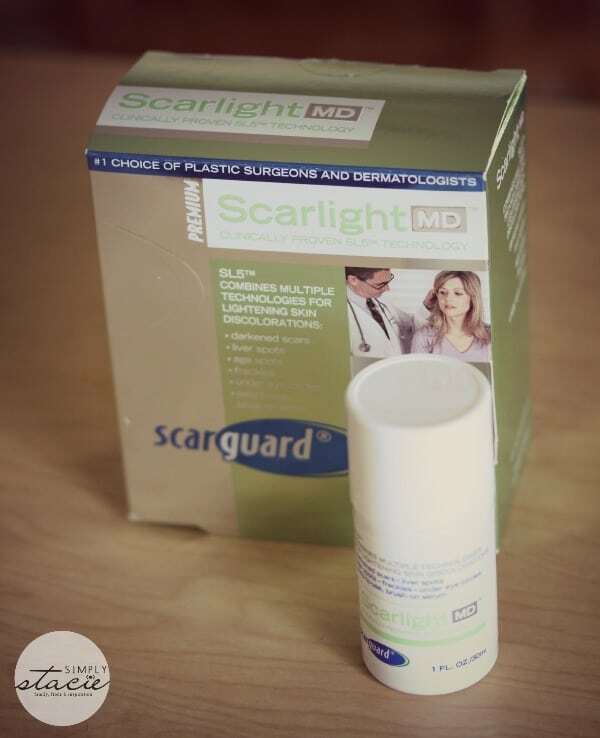 I’ve been using Scarlight MD on my many dark scars on my legs. It works to lighten existing dark, brown scars and diminish skin discolourations like circles under the eyes, age spots, liver spots, etc. I’m horrible for scratching mosquito bites and end up with a dark brownish scar. They fade eventually but the ones from this year are fresh and look awful. To apply, just brush the product on and rub it into the skin. It doesn’t leave a stain and absorbs almost instantly. I’ve only been using it for a few weeks and I’ve already noticed a difference. 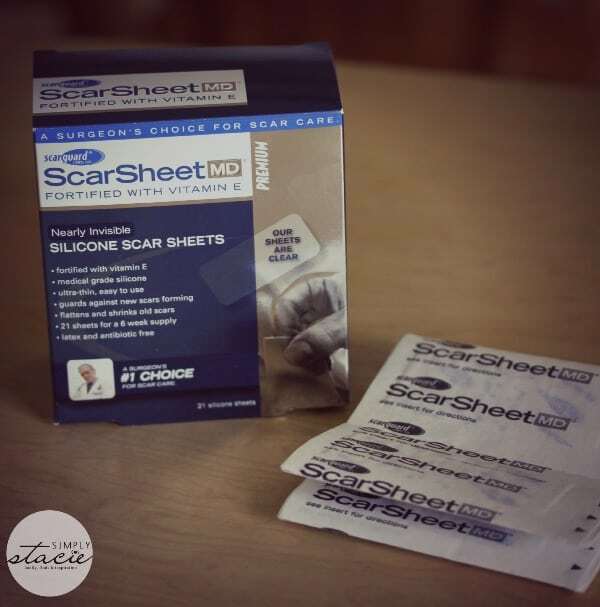 A package of ScarSheet MD contains a 6 week supply of silicone and vitamin E scar sheets. They are meant to be applied after the scar has healed and are designed to improve the scar’s appearance in 4 to 6 weeks. They can also be used on raised scars like what I have and in fact, they are recommended for that type of scar. The product works to flatten and shrink raised scars. The Scarguard website is a wealth of info about scars and their products. You can read more in depth about the science behind each one and learn how they work. Scarguard products are available without a prescription and can be purchased via their website, pharmacies, Target and major supermarkets. I have my secret weapon now for scars and plan to use it on any fresh scars I get (and knowing me I will get many!). i learned that you can get a product for under eye circles which i have a problem with too! learned that silicone gels and creams don’t help out because they are wet and if you rub until it is dry then you just rubbed off the cream/gel. I learned that A lot of scar treatment products contain a key ingredient that does not work well at all. 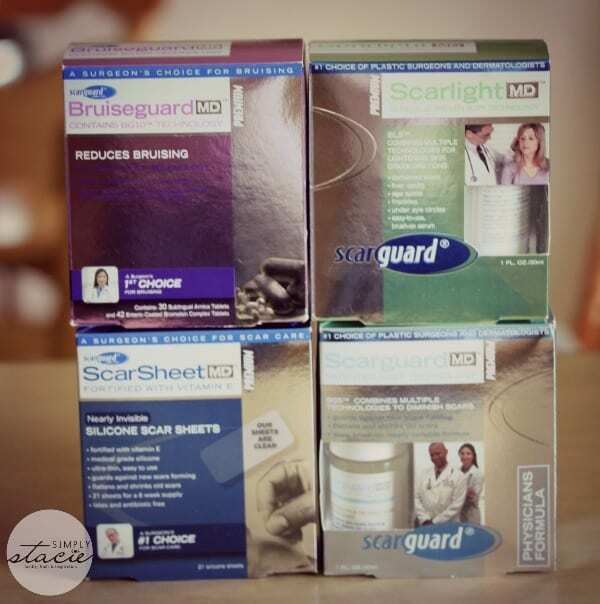 I learned that Scarguard can help reduce the appearance of scars and stretchmarks. As a mom of 3, who has also had 3 csections, this product would be perfect for me. I would love to have the chance to try it! My cesarean scar is so ugly to me after being cut so many times, I would be happy to see it at least become a little less gnarly looking! I learned that Scarguard was developed by a plastic surgeon! You can’t treat different scars with the same products, got pick the right product depending on the scar. I learned that it can take as long as one or two years for some scars to settle into how they will look after being totally healed. I learned that raised scars occur when the body over produces collagen to fill in the gap caused by injury or surgery. I learned something interesting about onion juice helping with scars. THE PLASTIC SURGEON’S SECRET FOR SCARS. PREVIOUSLY ONLY AVAILABLE IN DOCTORS OFFICES, NOW AVAILABLE TO YOU WITHOUT A PRESCRIPTION. Now that sounds like a great product! Would love to try! Scar guard was developed by a plastic surgeon. I learned that it is possible to get scars to fade. You can find it at target.